joanofdark.com: Trying to type without a pinky is hard. Trying to type without a pinky is hard. We were doing a round of 4, 2 minute scrimmages. I was having a great time blocking. It was hurting my shoulder like crazy, but I was still doing a good job. At one point, I felt a sharp pain in my hand, but didn't really stop and pay attention to it. I never fell, so it must have just whacked on someone's wrist guard. I kept scrimmaging, but by the end of the night I was in some real pain. Once that adrenaline fades, things start to hurt even more. Here's what it looks like now. This is a blurry, horrid picture, but it's really hard to take a picture of your own hand. You can see some of the bruising, but the black and blue doesn't really translate very well in the photo. It looks worse than that! It's not too bad right now. It hurts like screaming oh my god paiiiinnn if I touch it, and touching the middle knuckle hurts really bad for some reason. Eh, it's a bone. It grows back right? 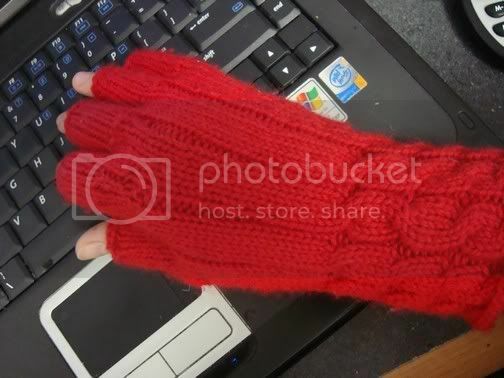 The lucky thing is, I just made these really cute gloves, and I can't tell you how GOOD they feel to wear, over the broken pinky. Putting them on hurts pretty bad, but once they're on.. mmm, bliss. I'm going to make another set, when I have time, but I'm going to replace the cables on the bottom with the slanting rib/fake cables I used for the "Know Your Buddy Wrist Cuffs". This cable is kind of tight, and I'm remembering the one on the wrist cuffs being snug, but still stretchy. Okay, typing is hurting, so I'm off.